OK here we go with the Hong Kong posts! This second trip was also organised by the Hong Kong Tourism Board (HKTB). We were thrilled to know we were going to stay at The Luxe Manor (pronounced "Deluxe Manor") at Kimberly Road, a stylish boutique hotel just down the street from The Mira, where the 10 SBA bloggers last stayed. The location is terrific - right in the heart of Tsim Sha Tsui's eating and shopping area, and a stone's throw from the MTR. It's also directly next to the trendy row of bars and restaurants at Knutsford Terrace. 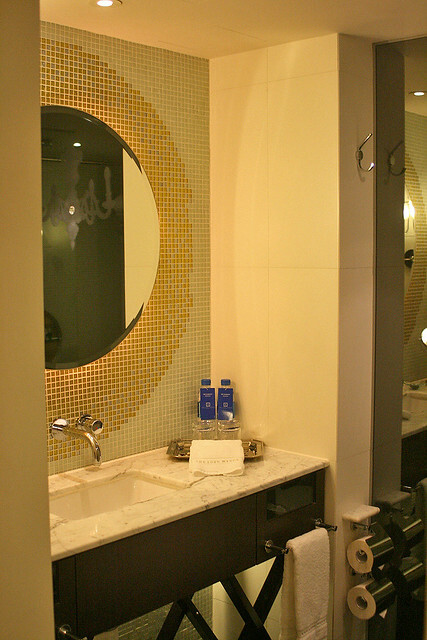 The Luxe Manor is the first designer boutique hotel in Kowloon, and is a member of the Small Luxury Hotels of the World. The place is a surreal yet modern take on old European manors. 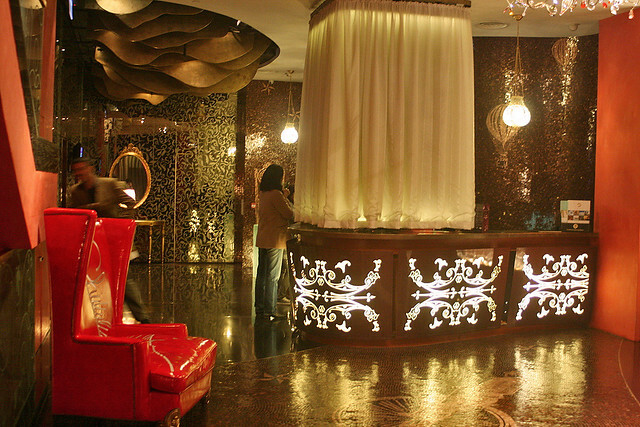 The ornate lobby is inspired by master Spanish architect Antonio Gaudi. It cocoons you in dark, rich, warm tones of red, violet, magenta, gold and black. The mosaic floor features clock and compass graphics depicting the distortion of time and space. 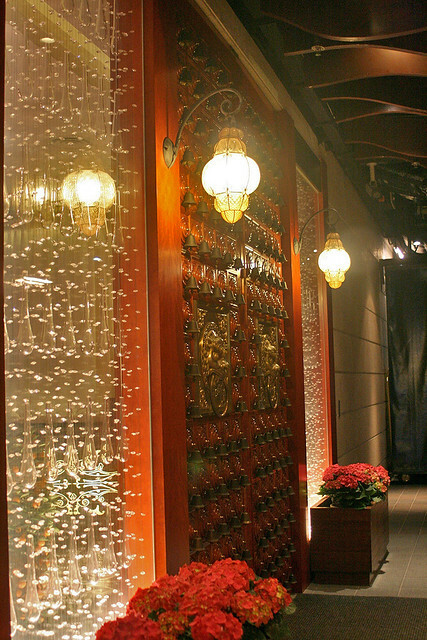 These grand entrance doors leading into the lobby are flanked by waterfall-like crystal lighting. This is where you leave your real world behind, and step into the surreal. There are all kinds of interesting. 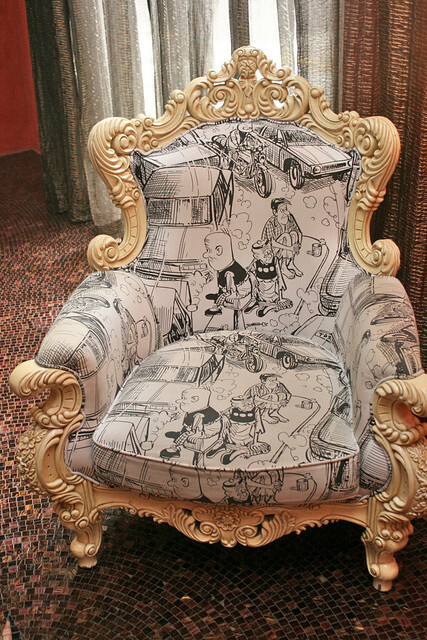 The centerpiece "Old Master Q" or Lau Fu Zi armchair pays quirky homage to artist Joseph Wong's famous comic series. 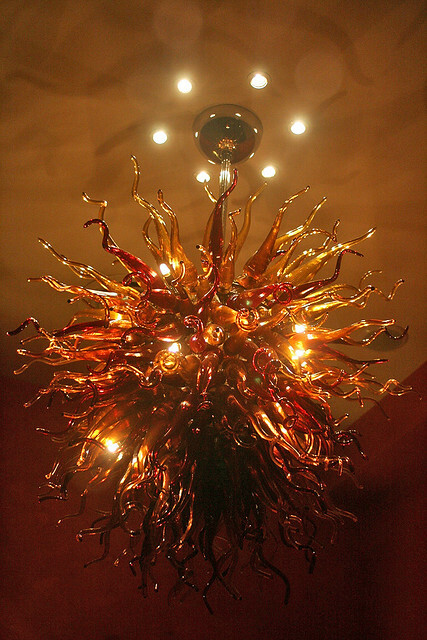 There are some beautiful chandeliers and lighting fixtures from Europe. The Luxe Manor has 153 rooms and six specially-themed suites (which I will show you in a separate post). 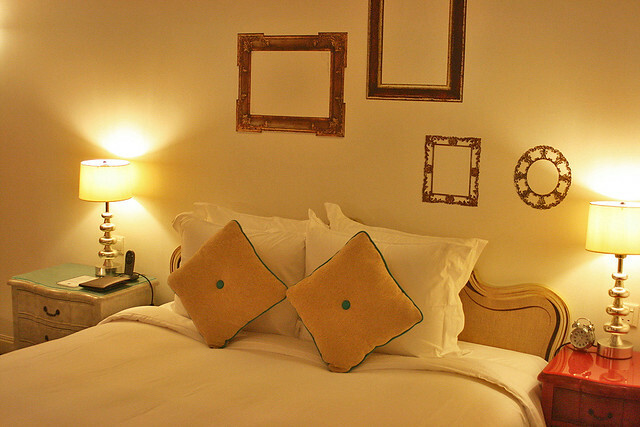 This is the normal guestroom. The art frames have been painted on the wall and extend to the ceiling, in keeping with the surreal theme. You get a retro alarm clock too! How quaint! I half-expected it to be a wind-up clock, but it runs on batteries, so no worries about keeping it on time. The real and surreal blend together - that's a faux fireplace below the real mantelpiece. 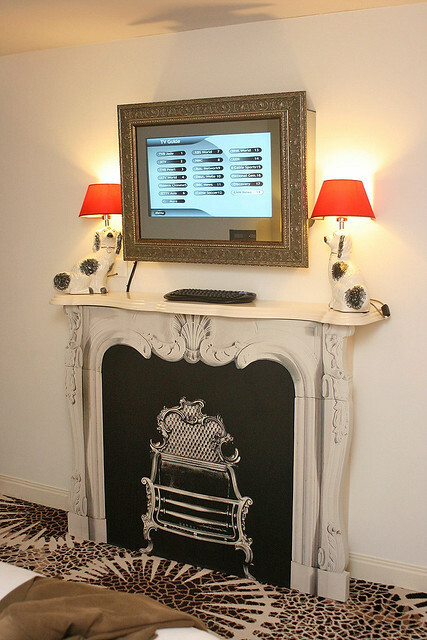 The flatscreen TVs are all encased within elaborate art frames. There's cable TV, broadband internet, video-on-demand, and the hotel channel all on the same device. 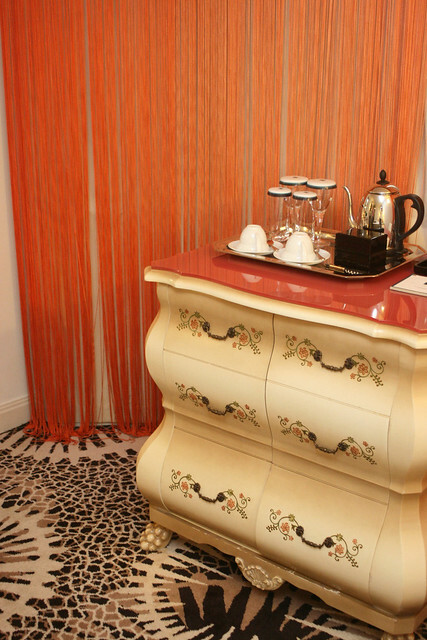 The room also comes with wi-fi Internet access, and VOIP telephony. 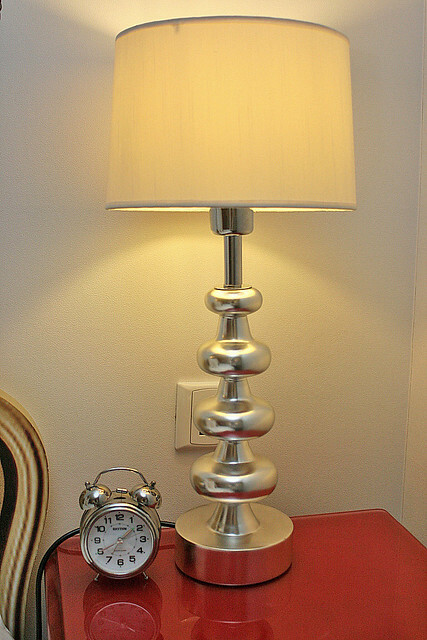 The decorative is also the functional. 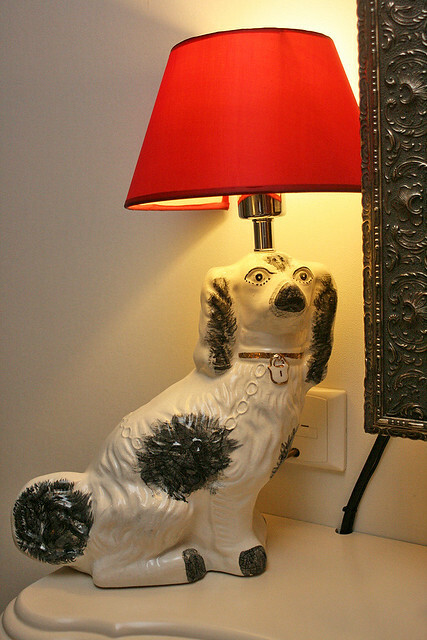 A ceramic dog lamp attached to the wall. 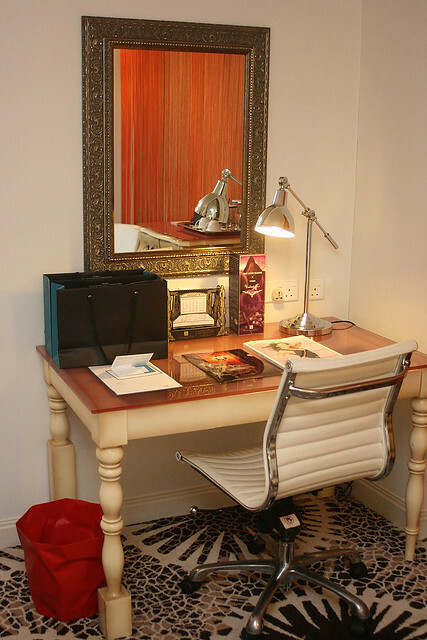 A desk with mirror doubles up as both worktable and dressing counter. Notice the red "crumpled" designer wastepaper bin (bottom left)? I love the little touches like that. There's a similar white one in the bathroom. The mini-bar area is cute. There's this curvy sidetable that looks like a set of drawers, but two large doors open out like a cupboard to reveal the fridge. 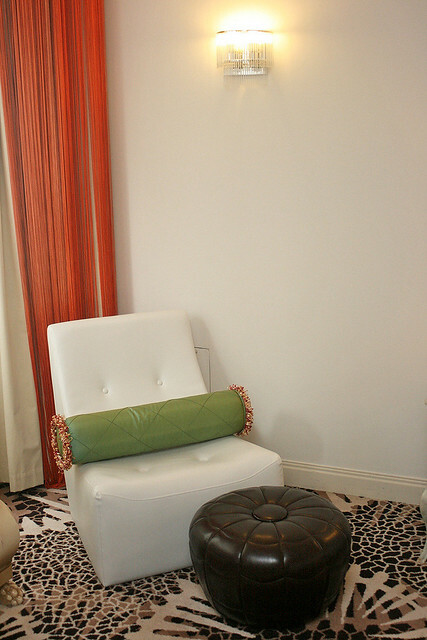 A small cosy area for lounging around and putting your feet up. 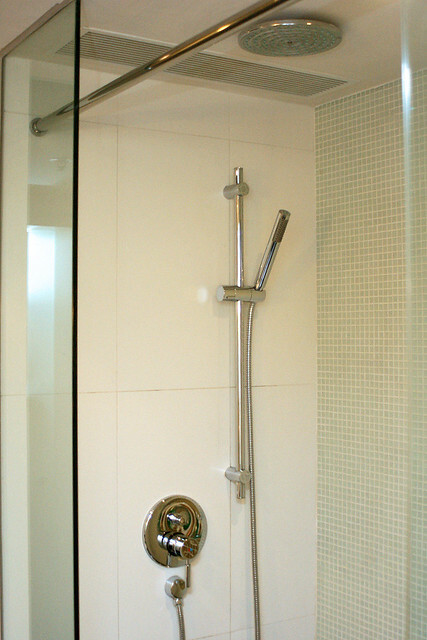 The bathroom is very clean, neat and well-laid out (the hairdryer, vanity supplies and toiletries are inside the drawers). 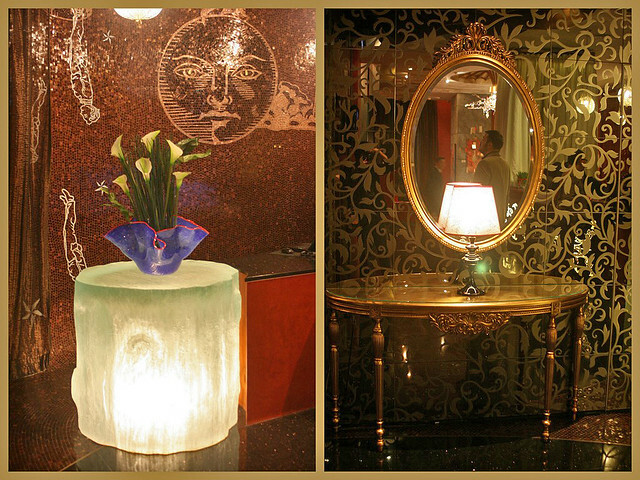 Marble and glass tiles lend classy elegance to the walls. I didn't notice it at first, but I was surprised that there is no bathtub. Well, I didn't really miss it, as the overhead rain shower is luxurious enough. 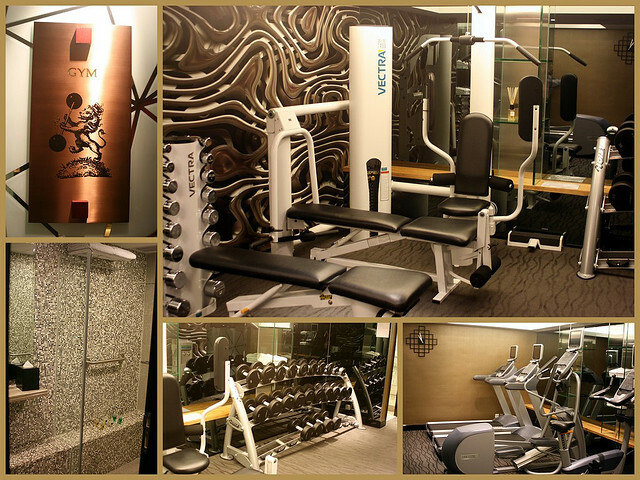 You'll find a small but sufficient gym in the basement. No swimming pool, but you can still keep fit. 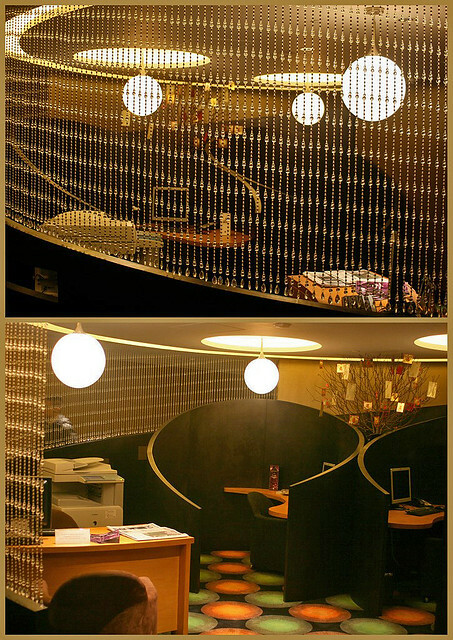 Even the business centre has its own personality. It's in the basement, next to the gym. The Luxe Manor has won several awards - you can look them up on the website. The boutique hotel is gaining popularity with luxury travel and business visitors, who prefer to check in to something a little more adventurous and unusual. The call to Hong Kong has grown louder and louder, thanks to your posts. Looks like a sweet place to stay, will have to check it out on my next sojourn!